Terminal 2B is a satellite pier for the new Heathrow Terminal 2 development and the first UK airport facility to achieve a BREEAM rating of ‘Very Good’. 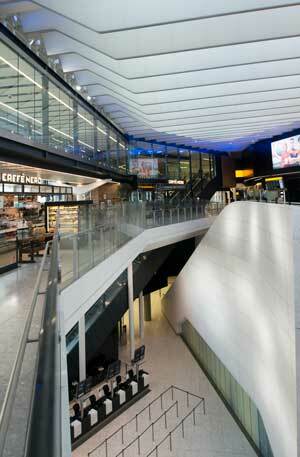 Accommodating 16 long-haul stands, Terminal 2B is a 520m-long steel-framed satellite pier for Heathrow’s new Terminal 2. Sitting above a three-level basement, the building has been designed whereby arriving passengers use the floor above departing passengers, inverting the familiar ‘undercroft’ experience of the arrivals journey. “Steel structure is articulated as a key generator of the architectural form, and the design team utilised a palette of exposed structural steel frame, clad in large prefabricated façade panels and finished with profiled steel or toughened-laminated glass to create a highly engineered internal environment,” says Grimshaw Architects’ Partner Andrew Thomas. Among the first steel elements fabricated and installed onsite were the 163 plunge columns, assembled from the heaviest UC section and two 40mm thick steel plates, welded together to create a thick-walled box. The efficiency of this section and the novel ‘top hat’ connection – which transfers load from the concrete apron slab into the columns – allows unrestrained column lengths of up to 15m despite supporting axial loads of up to 20MN. 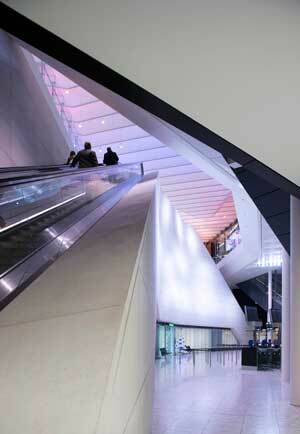 Client: Heathrow Airport LtdThe basement measures 360m long, 60m wide and is 15m deep. As well as providing space for plant and baggage handling systems for the pier, it will in the future accommodate a station for an automated passenger transit system linking the pier with T2, T5 and a number of other satellite piers. “To fit in with the groundworks team, who were constrained by various airport workings, we reversed the erection sequence and worked south to north,” says Severfield Project Manager Andrew Luter. The steelwork frame of the pier consists of three basement levels and four above ground levels topped with a steel roof. Above ground a lot of design work has gone into producing a light and airy structure, one that is welcoming to passengers and to this end steelwork has played a crucial role. “We’ve worked very closely with the architects to refine the steelwork details to form sculptural shapes and to integrate the structural frame seamlessly into the building fabric,” says Mott MacDonald Structural Director Nick Sexton. The most striking and noticeable architectural steel features are a series of internal CHS columns with bespoke connections that form the Departures and Arrivals halls. The columns stand the full height of the building and have a pencil point connection at the top and a wishbone shaped connection further down that joins to the pier’s second floor. Summing up, the judges say the varying degrees of complexity of the steelwork, and its architectural exposure, were very well planned, detailed and executed.